Saturday was a big day of activity for the LVBC with 2 batches of red ale produced, 2 new mash tuns built, a batch of porter bottled and a tasting session afterwards. It was the first day in the “brew off” format where we have two brew-masters each brewing a batch to a particular style and competing against each other. The beer style had been decided beforehand through a poll of the members and a red ale was chosen. 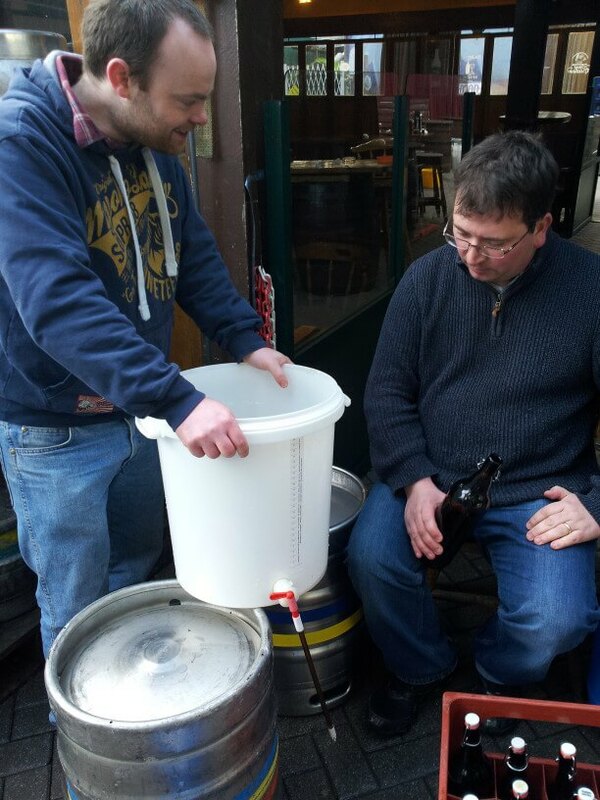 Sean and Barry were the two brew-masters, with assistants being myself and Frans respectively. By the time I arrived at 9:30am both mash tuns were filled and shut – all going smoothly. 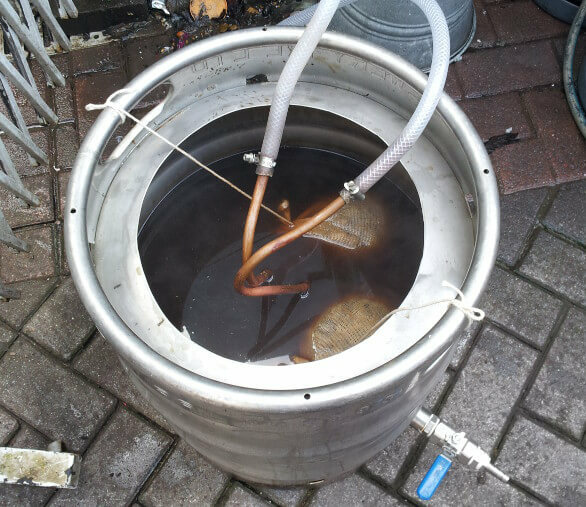 After a 60 minute mash we recirculated about 6 litres and ran off the clear wort to the boil kettle. I added 20L of sparge water at 79C to the mash tun to give about 31L of wort total. The two boilers used were converted kegs over gas burners. They are both almost identical but somehow the boiler I was tending to took a lot longer to get to the boil. This worked out to be fairly convenient later as Barry’s pot was first on the chiller coil and was completely chilled just as Sean’s pot reached the end of the boil. Sean was in and out on the morning delivering his children to and from activities so I got plenty of experience running the brew by myself. I’m one of the brew masters next month so I need the practice! Sean’s brew was unusual in that he didn’t use any bittering hops, only adding hops with 15 minutes left, more at 10 minutes and a hefty 160g of hops at 5 minutes left in the boil. I don’t know the details of the hop varieties or any of the details in Barry’s brew so they will have to fill in the gaps here. Two new club mash tuns were assembled from scratch from a length of copper pipe, two Coleman coolers and a bunch of plumbing fittings. 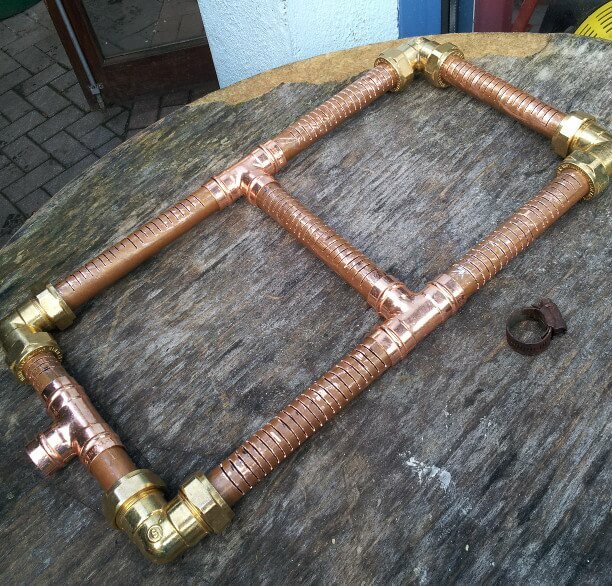 Barry and Garry were an impressive team getting stuck in to cutting the copper pipe, adding drainage slits and assembling to the correct shape. A dremel tool briefly made an appearance but it was quickly realised that power tools were much slower than the hacksaw! In parallel with the manifold work, Sean removed the drain plugs from the coolers and fitted threaded pipe and valves. I cut washers from a silicone baking sheet and added them inside and outside of the cooler wall to make it watertight. While these were being built Brian and Peter were also hard at work. Peter had a brew going on the big system in the Franciscan well brew house and we got to see him shoveling out enough spent grain to fill two wheelie bins almost to the top! Once the LVBC fermenters were filled Peter added fresh yeast to both of them. Brian brought a fermenter out from the cold-room and managed to get it all bottled up. He also brought out a fermenter full of lager which he was planning to transfer to secondary but I didn’t get to see this. After all the work was done the brew-club members sat down for a well-deserved break. There was a great variety of beers to sample including a Cider which I thought was very tasty and Kwak clone which might have been a bit too sour for style. There was a beer with hemp, a pine flavoured liqueur at 30% ABV and a bunch of other odd drinks from Sean. Frans brought a Galaxy porter and his Orange Rye Porter which I thought was excellent. I brought a bunch of stuff myself including an English mild, some of my oatmeal ale, a coriander wheat beer and my accidental Belgian style beer. Brian also brought out a few bottles of the spiced barley-wine which is over a year old now; it has mellowed a bit but still has a very strong spicy hit. After a few drinks out in the cold and as the light was fading we moved the tasting in towards the space heaters at the back of the bar. Myself, Barry and Steve were joined by David and shortly afterwards decided to move the group to a party at Barry’s house. I was fairly exhausted at this point but did make it over to the party for a little while. When the very lively crowd announced they were going in to town I knew it was time for bed and I snuck away home. Quite a busy, enjoyable, long, exhausting day. Roll on next month!